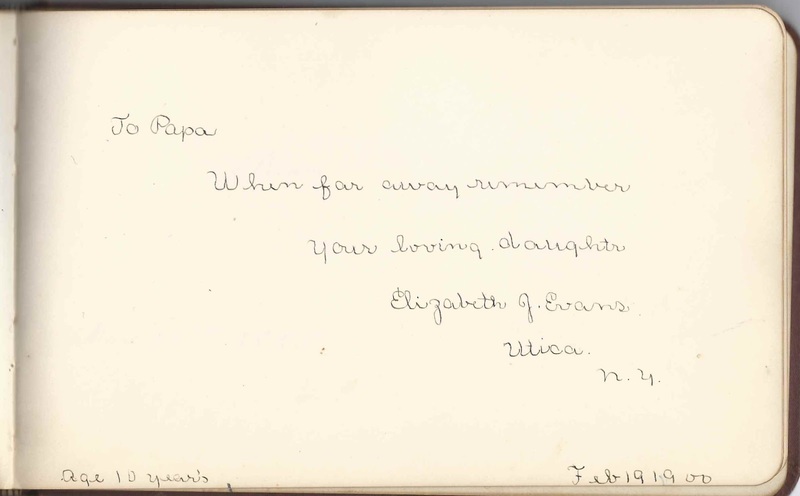 Heirlooms Reunited: 1870s/1890s+ Autograph Album of David W. Evans of the Utica, New York, area. 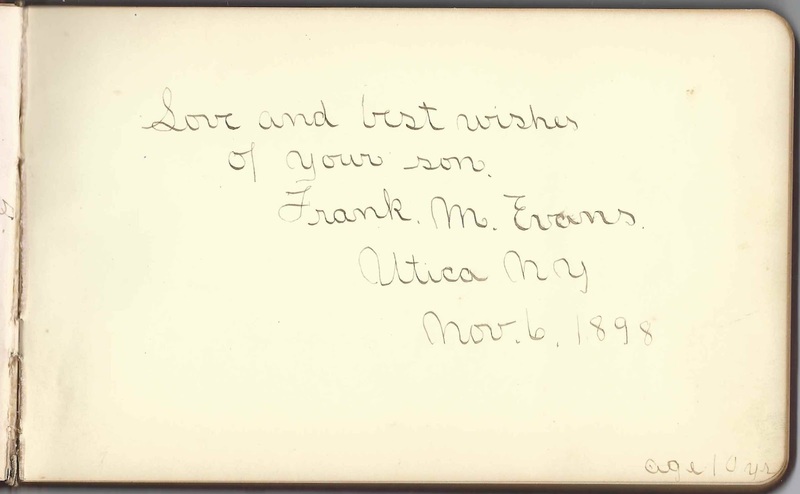 1870s/1890s+ Autograph Album of David W. Evans of the Utica, New York, area. 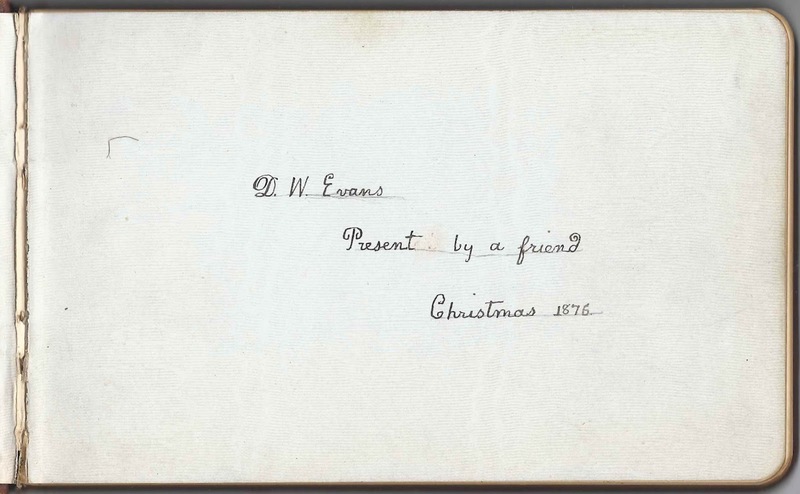 1870s/1880s+ autograph album of David W. Evans of the Utica, New York area. 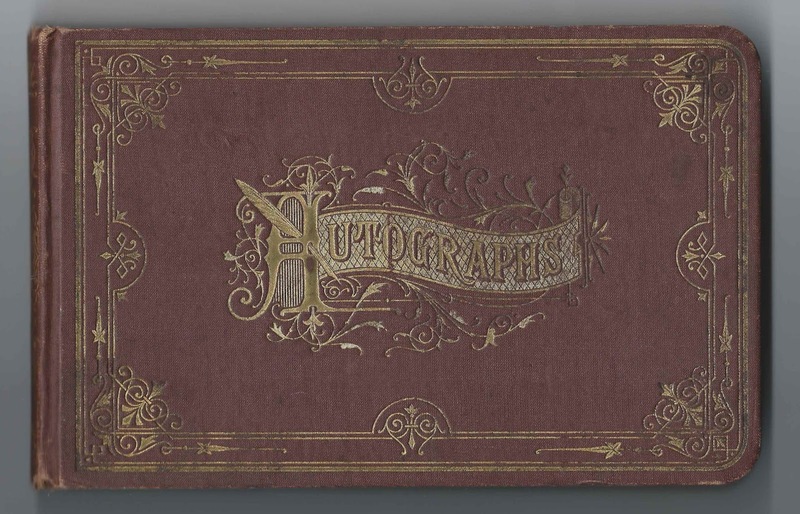 The album was presented to him by a friend at Christmas in 1876. 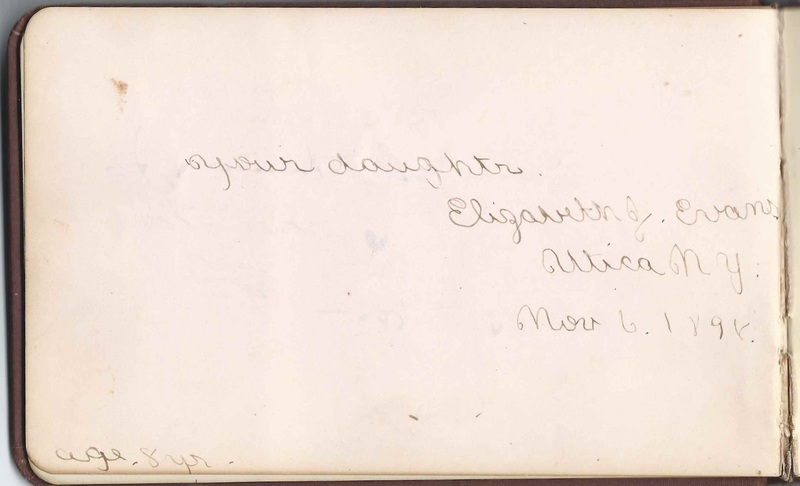 The album measures approximately 7-3/4" x 5" and contains the sentiments of 89 of David's relatives and friends. An alphabetical list of the signers appears at the end of this post. At least some of the signers had an affiliation with what was at the time called the New York State Lunatic Asylum at Utica, New York. It's now called the Utica Psychiatric Center. Theodore Deecke was a pathologist there. He and his wife Clara signed pages in November 1877. 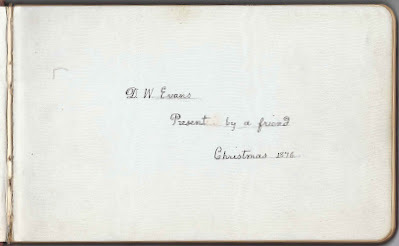 David W. Evans was born 7 July 1842 in New York, near Constableville, the son of Owen O. Evans and Jennett (Jones) Evans. His family was Welsh. About 1887, David married Jennie Morris, daughter of William R. and Eliza Morris. I believe Jennie was a supervisor at the Asylum. 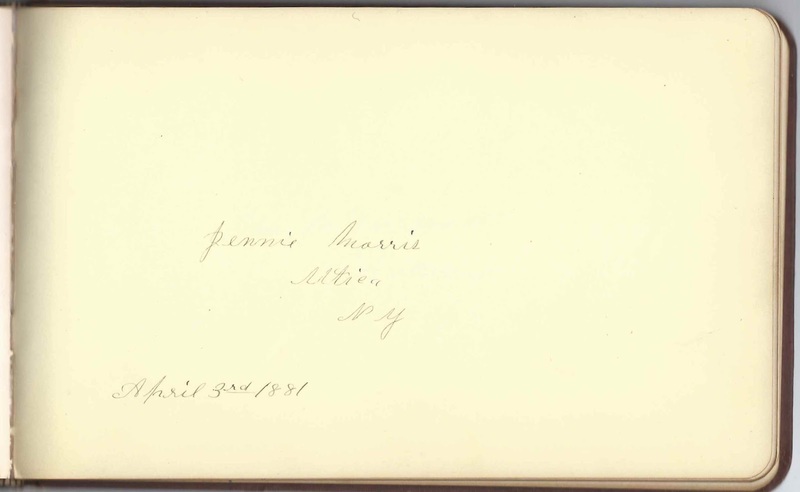 She is presumably the Jennie Morris who signed a page in David's album on April 3, 1881. 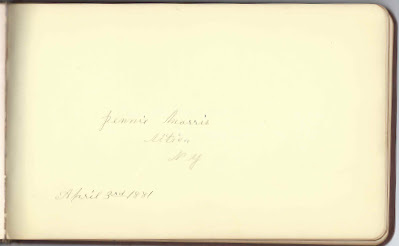 Nathaniel Brainard of Oriskany Falls, New York, signed on June 28, 1886. He wrote 73 August 15, 1886, which was his 73rd birthday. 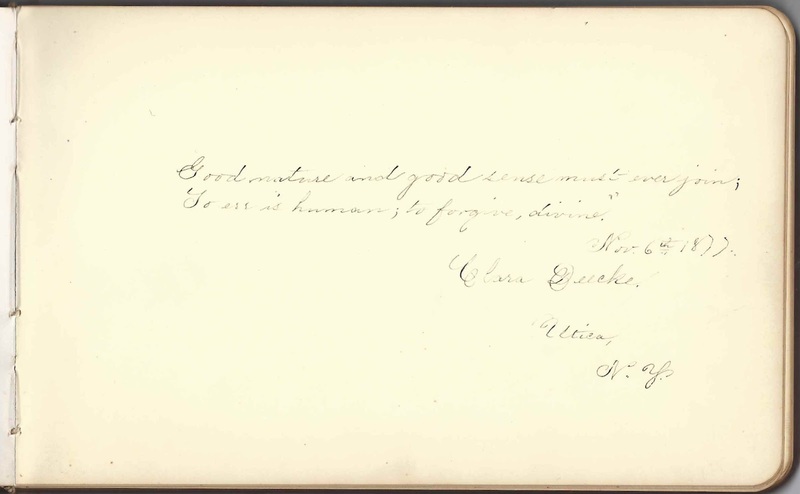 C. J. Coe of Lowville, New York, signed on June 27, 1885; presumably Calvin J. Coe, whose son Ira R. Coe signed the right facing page. Mrs. C. J. Coe of Lowville, New York, signed in June 1885. Penciled note: "Died May 27, 1900". She was Hannah (?) Coe, wife of signer Calvin J. Coe and mother of signer Ira R. Coe. 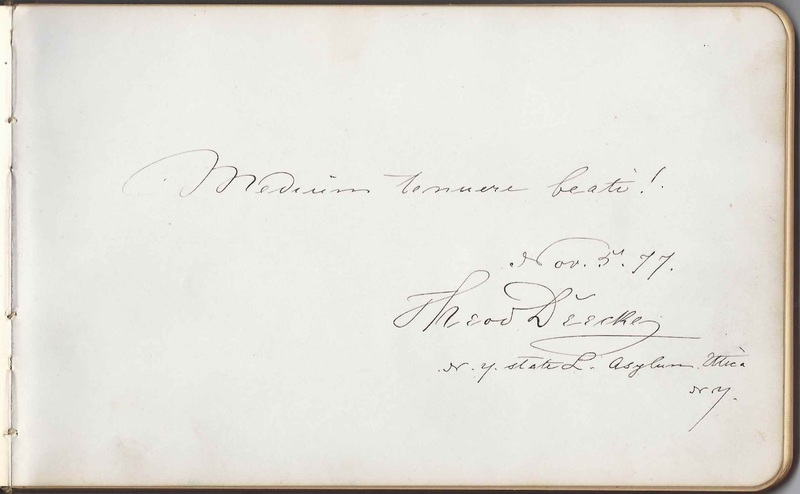 Theodore Deecke, signed at the New York State Lunatic Asylum at Utica, New York, on November 5, 1877. He was the pathologist there. 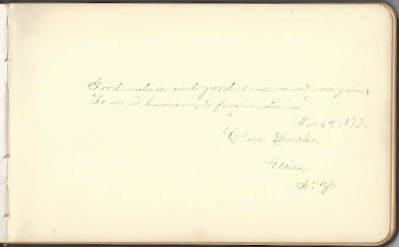 Clara Deecke of Utica, New York, signed on November 6, 1877; her husband Theodore Deecke also signed a page. 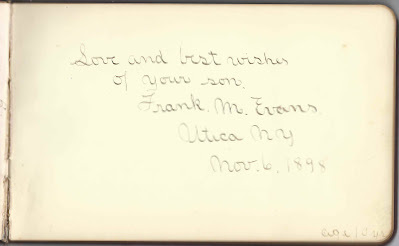 Frank M. Evans of Utica, New York, signed on November, 6, 1898; David W. Evans' son Frank Merrill Evans, born 13 April 1888; died 1949. 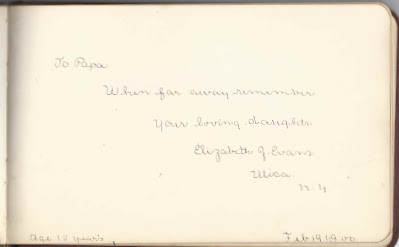 Owen T. Hughes of Leyden, New York, signed on September 15, 1887, "aged 37"
Jennie Jones of Madison County, New York, signed on February 12, 1883; her husband David W. Jones signed the right facing page. 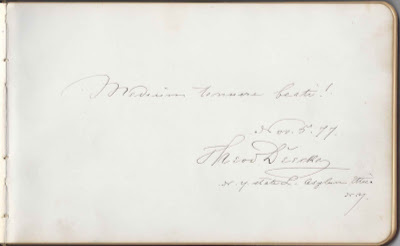 David L. Jones of Madison County, New York, signed on February 12, 1883; his wife Jennie Jones signed the left facing page. Miss Della Morris of Peru, Indiana, signed on September 5, 1899. 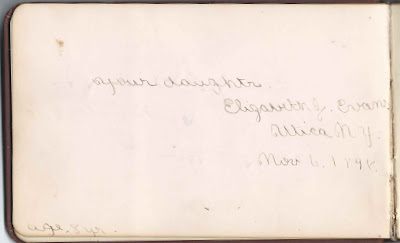 Daughter of Griffith Alvin Morris and Eliza Jane (Engel) Morris. 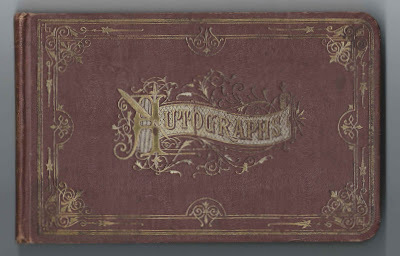 M. G. Palmer, signed at Herkimer, New York, in December 1877; middle initial could be J or ? Charles W. Roberts of Utica, New York, signed on "6/7/85"